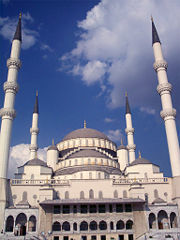 Ankara is the capital of Turkey and the country's second largest city after İstanbul. The city is located in the northwestern part of the country, and has a population, as of 2005, of 4,319,167 (Province 5,153,000), and a mean elevation of 850 m (2800 ft). It was formerly known as Angora. The Hittites gave it the name Ankuwash; the Galatians and Romans called it Ancyra; and in the classical, Hellenistic, and Byzantine periods it was known as Ἄγκυρα Ánkyra. 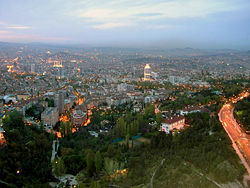 Ankara also serves as the capital of the Province of Ankara. Centrally located in Anatolia, Ankara is an important commercial and industrial city. It is the center of the Turkish Government, and houses all foreign embassies. It is an important crossroads of trade, strategically located at the center of Turkey's highway and rail network, and serves as the marketing center for the surrounding agricultural area. Some of Turkey’s largest construction companies are based in Ankara, as are important defense industries such as the joint Turkish-American venture TUSAŞ Aerospace Industries, Incorporated. The city was famous for its long-haired Angora goat and its prized wool (mohair), a unique breed of cat (Angora cat), white rabbits and their prized wool (Angora wool), pears, honey, and the region's muscat grapes. Ankara is situated upon a steep and rocky hill, which rises 500 ft. above the plain on the left bank of the Enguri Su, a tributary of the Sakarya (Sangarius) river. The city is located at 39°52'30" North, 32°52' East (39.875° N 32.8333° E) and lies about 125 miles (200 km) south of the Black Sea. The city is one of the driest places in Turkey and is surrounded by a barren featureless steppe vegetation, with various Hittite, Phrygian, Greek, Roman, Byzantine, and Ottoman archaeological sites. It has a harsh, dry continental climate with cold, snowy winters and hot, dry summers. Rainfall occurs mostly during spring and autumn. The hill is crowned by the ruins of the old castle, which adds to the picturesque view; little else is preserved of the old town, which was not well built. Many of its houses were constructed of sun-dried mud bricks along narrow streets. There are, however, many finely preserved remains of Greek, Roman and Byzantine architecture, the most remarkable being the Temple of Augustus (20 B.C.E.) also known as the Monumentum Ancyranum. The region's vibrant history can be traced back to the Bronze Age Hatti civilization, which was succeeded in the second millennium B.C.E. by the Hittites, in the tenth century B.C.E. by the Phrygians, and then by the Lydians and Persians. The city was expanded by the Greeks of Pontos, who developed it as a trading center for the commerce of goods between the Black Sea ports, Crimea, Armenia, and Georgia on the north; Assyria, Cyprus, and Lebanon to the south; and Persia to the east. By that period the city took also its name "Áγκυρα"-"Àngyra" which is still used until today by the Turks. Persian sovereignty lasted until the Persians were defeated at the hands of the Macedonian king Alexander the Great. In 333 B.C.E., Alexander came from Gordium to Ankara. After his death at Babylon in 323 and the subsequent division of his empire among his generals, Ankara and its environs came under the dominion of Antigonus. In 278 B.C.E., Ankara was occupied by the Gaulish people of Galatia, who were the first to make Ankara their capital. It was then known as Ancyra, meaning "anchor" in Greek. Ankara's written history starts with the Galatians. [[Image:Galatia Map.png|thumb|left|250px|Ancyra was the capital of the Roman province of Galatia. The city subsequently fell to the Roman Empire in 189 B.C.E. and became the capital of the Roman province of Galatia. Under Roman rule, Ankara was a gateway to the east for Rome, and as such was well developed, achieving the status of "city-state" or polis. The city's military as well as logistical significance lasted well into the long reign of the Byzantine Empire, even after the empire's capital was moved from Rome to Constantinople. Although Ankara temporarily fell into the hands of several Arab armies after the sixth century, it remained an important crossroads polis within the Byzantine Empire until the late eleventh century. In 1071 Seljuk Sultan Alparslan threw open the door to Anatolia for the Turks by his victory at Malazgirt. He then annexed Ankara as Turkish territory in 1073. Byzantine Emperor Alexios I Komnenos recaptured the city, an important location for military transportation and natural resources, from the Turks during the First Crusade. Ankara was held by the Byzantines until the end of the twelfth century, when it passed out of Byzantine control forever. Orhan I, second "bey" of the Ottoman Empire captured the city in 1356. A rival Turkic leader, Timur Lenk, besieged Ankara as part of his campaign in Anatolia, but in 1403 Ankara was again under Ottoman control. 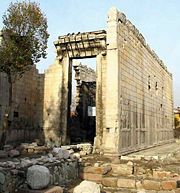 The city was the center of an Ankara Province in the later years of the empire. The leader of the Turkish nationalists, Kemal Atatürk, established the headquarters of his resistance movement in Ankara in 1919. After the War of Independence was won and the Ottoman Empire was dissolved, Turkey was declared a republic on October 29, 1923, Ankara having replaced İstanbul (formerly Constantinople) as the capital of the new Republic of Turkey on October 13, 1923. After Ankara became the capital of the newly founded Republic, the city was divided into an old section, called Ulus, and a new section, called Yenişehir. Ancient buildings reflecting Roman, Byzantine, and Ottoman history and narrow winding streets mark the old section. The new section, now centered around Kızılay, has the trappings of a modern city: wide streets, hotels, theaters, shopping malls, and high-rise buildings. Government offices and foreign embassies are also located in the new section. The Ankara Citadel (Ankara Kalesi) is the oldest part of the city, and rests on a hill 978 meters high. It has hosted several civilizations at various periods of history. The foundations of the citadel were laid by the Galatians on a prominent lava outcrop. During the Galatian period the castle was enlarged and city walls added and brought to a position completely overlooking the town, and the rest was completed by the Romans. The Byzantines and Seljuk Turks made further restorations and additions. Roman Ankara was a city of some importance, and several significant Roman structures remain, including a Roman theater, Temple of Augustus, Roman bath and the Column of Julian. This column, in Ulus, was erected in 362 C.E., to commemorate a visit by the Roman Emperor Julian the Apostate, nephew of Constantine the Great, and Rome's last pagan emperor. It stands 15 meters high and has a typical leaf decoration on the capital. The Haci Bayram Mosque is in the Ulus quarter next to the Temple of Augustus. It was built in the early fifteenth century in Seljuk style by an unknown architect. It was subsequently restored by the famed Ottoman architect Sinan in the sixteenth century, with Kütahya tiles being added in the eighteenth century. The mosque was built in honor of Haci Bayram Veli, whose tomb is next to the mosque, two years before his death (1427-1428). Open space of this mosque is 437 square meters on the ground floor and 263 square meters on the second floor. While Istanbul is steeped in centuries of history, and remains the country's business and financial center, Ankara is the showcase of modern Turkey. Modern Ankara is a planned city. When the Republic's founder Mustafa Kemal Atatürk declared it the new nation's capital, it was a dusty Anatolian backwater of 30,000 people. He brought urban planners from Europe who created a city of broad avenues, green parks, and an artificial lake, all surrounded by modern residential and diplomatic residences. At the heart of modern Ankara is Atatürk's mausoleum, Anıtkabir. It is located on an imposing hill in the Anittepe quarter of the city and is a place of pilgrimage for all Turks. Completed in 1953, it is an impressive fusion of ancient and modern architecture. An adjacent museum houses a wax statue of Atatürk, his writings, letters and personal items, as well as an exhibition of photographs recording important moments in his life and in the establishment of the Republic. Ankara's premier museum is the Museum of Anatolian Civilizations (Anadolu Medeniyetleri Müzesi). It is housed in a restored Ottoman covered market. It houses a unique collection of Paleolithic, Neolithic, Hatti, Hittite, Phrygian, Urartian, and Roman works and showpiece Lydian treasures. The War of Independence Museum (Kurtuluş Savaşı Müzesi) is in Ulus Square, and was the first parliament building of the Republic of Turkey. The War of Independence was planned and directed here as recorded in various photographs and items presently on exhibition. In another display, wax figures of former presidents of the Republic of Turkey are on exhibit. Ankara has many parks and open spaces mainly established in the early years of the Republic which have been well maintained and expanded thereafter. 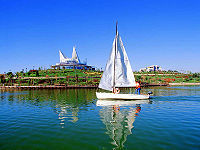 The most important of these parks are: Gençlik Park (houses an amusement park with a large pond for rowing), the Botanical Garden, Seğmenler Park, Anayasa Park, Kuğulu Park (famous for the swans received as a gift from the Chinese government), Abdi Ipekci Park, Güven Park (see above for the monument), Kurtuluş Park (has an ice-skating rink), Altın Park (also a prominent exposition/fair area), Harikalar Diyari (claimed to be Biggest Park of Europe inside city borders) and Göksu Park. Foreign visitors to Ankara usually like to visit the old shops in Çıkrıkçılar Yokuşu (Weavers' road) near Ulus, where a myriad of things ranging from traditional fabrics, hand-woven carpets and leather products can be found for bargain prices. The Bakırcılar Çarşısı (Bazaar of coppersmiths) is particularly popular, and many interesting items, not just of copper, can be found there like jewelry, carpets, costumes, antiques and embroidery. Up the hill to the castle gate, there are many shops selling a huge and fresh collection of spices, dried fruits, nuts, and other produce. As Ankara started expanding westward in the 1970s, there were several modern, suburbia-style developments and mini-cities along the western highway, also known as Eskişehir road. The Armada mall on the highway, the Galleria in Ümitköy, and a huge mall in Bilkent Center offer North American and European style mall-shopping opportunities. (These can be reached following the Eskişehir highway). There is also the newly expanded Ankamall on the outskirts following the Istanbul highway which houses most well-known European brands. 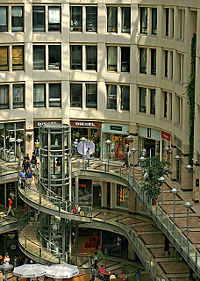 This mall is the largest in the Ankara region. Hacettepe University English and Turkish. www.hacettepe.edu.tr. Retrieved September 22, 2007. Middle East Technical University English and Turkish. www.odtu.edu.tr. Retrieved September 22, 2007. TOBB Economics And Technology University English and Turkish. www.etu.edu.tr. Retrieved September 22, 2007. Ufuk University Turkish only. www.ufuk.edu.tr. Retrieved September 22, 2007. Esenboğa International Airport, located in the north of the city, is the main airport of Ankara. Ankara Intercity Bus Terminal (Turkish: Ankara Şehirlerarası Terminal İşletmesi, AŞTİ) is an important part of the bus network which covers every neighborhood in the city. The central train station "Ankara Garı" of Turkish Republic Railways (Turkish: Türkiye Cumhuriyeti Devlet Demiryolları, TCDD) is an important hub connecting the western and eastern parts of the country. EGO (Elektrik Gaz Otobüs) operates the public transportation. 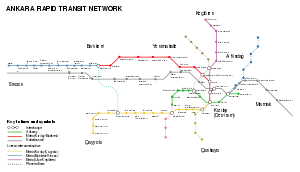 There are currently two subway lines in the city and three more are under construction. All links retrieved March 22, 2016. Turkey CIA World Fact Book. This page was last modified on 22 March 2016, at 15:13.